Getting your California driver's license doesn't have to be hard. 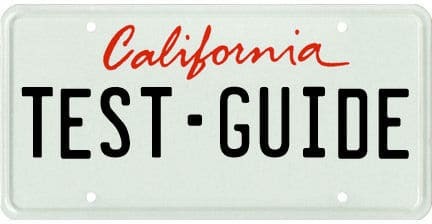 Use Test-Guide.com's free California practice permit tests to prepare for your exam the fast and easy way. Our questions come right from the source - the California DMV driver's handbook. How Do I Get A California Driver’s Permit? How Old Do I Have to Be to Get a California Permit? What are the Appropriate Birth Date/Legal Presence Documents? What Tests Are Required to Obtain a California Permit? What Driver’s Education Do I Have to Take? What are the Driving Restrictions for a Permit? What Is the Passing Grade for a California Permit Test? What Happens if I Fail the Permit Test? How Should I Study for the California Permit Test? How Much Does it Cost to Take the California Permit Test? What are the Requirements to Get a California Learner’s Permit? Where Do I Take the California Permit Test? Do I Need an Appointment? Q: How Do I Get A California Driver’s Permit? To obtain a California driver’s permit, you must provide the appropriate birth date/legal presence documents and your social security number, you must also be fingerprinted and photographed, pay the application fee, and you must pass the California driving laws test. If you are under eighteen years old, you must also have written approval from one or both of your parents. Q: How Old Do I Have to Be to Get a California Permit? Minors in California are able to apply for a permit when they are 15 and a half years old. However, this will require you to take a mandatory driver’s education course. To avoid the driver’s education requirements, you must be at least 17 and a half years old. Q: What are the Appropriate Birth Date/Legal Presence Documents? Only documents issued by a county or state with an official seal will qualify as acceptable birth date/legal presence documents. You must provide the original document—photocopies will not be accepted. Examples of these appropriate documents include a U.S. birth certificate, a U.S. passport, an armed forces ID card, a naturalization certificate, or a permanent resident card. Other (but less common) documents include a marriage or domestic partnership certificate, adoption papers containing your legal name, change of name documents (must have your name both before and after legal change), or dissolution of marriage documents. Q: What Tests Are Required to Obtain a California Permit? To obtain a California driver’s permit, you will have to take a vision test, a written test about California driving laws, and a behind-the-wheel driving test. Your vision test can be taken with or without corrective lenses. Your behind-the-wheel driving test will require an appointment, and no exams are given after 4:30 pm to ensure that applicants have enough time to finish their tests. Q: What Driver’s Education Do I Have to Take? If you are 17 and a half years old or older, you are not required to attend any sort of driver’s education courses. If you are under 17 and a half years old, you must provide proof that you have successfully completed or are currently enrolled in a driver’s education course. Your driver’s education course will provide you with a certificate confirming your completion or enrollment in their program. Q: What are the Driving Restrictions for a Permit? The restrictions on your permit will vary depending on whether or not you have reached your 18th birthday. For those over eighteen, you must be accompanied by a driver eighteen years or older with a valid California driver’s license. You will not be permitted to drive alone with only a driver’s permit. For minors, you will not be permitted to drive until your driver’s education instructor validates your permit with a signature. You must always be accompanied by a parent, guardian, spouse, driving instructor, or adult aged 25 years or older. Q: How Many Questions Are on the California Permit Test? The California DMV written exam will contain a total of 46 questions pertaining to the traffic laws, road signs, and safe driving practices within the state of California. For the driving section of your test, you will be required to locate and use your vehicle’s controls correctly—including the parking brake, headlights, windshield wipers, emergency flashers, and defroster. Q: What Is the Passing Grade for a California Permit Test? On the written test you must answer at least 38 questions correctly to pass the exam. It is up to the discretion of the test administrator to determine whether you pass or fail the driving portion of your permit test. Q: What Happens if I Fail the Permit Test? The application fee you pay entitles you to take your driving tests up to three times within a twelve month period. If you fail all three attempts or do not complete the test within the twelve month limit you will be required to pay another application fee—granting you another three attempts in twelve months. Q: How Should I Study for the California Permit Test? The California DMV provides you with a number of resources to study for your permit test. Applicants preparing for the test should familiarize themselves with the information contained in the online brochure How to Prepare for Your Driving Test provided on the California DMV website. This will provide you with a checklist of preparations for the test. There are also several practice tests that applicants can access through the California DMV website as well. Even though driver’s education courses are not mandatory for applicants aged 17 and a half or older, you should consider enrolling in one if you are particularly concerned about your success. Q: How Much Does it Cost to Take the California Permit Test? The application fee for the California driver’s test is $33. As mentioned earlier, this fee is good for a twelve month period and up to three attempts at the test. Q: What are the Requirements to Get a California Learner’s Permit? The requirements for a learner’s permit are similar to those of a full-fledged driver’s license. You must have the appropriate birth date/legal presence documents, you must pass the written examination of California driving laws, and you must have parental approval if you are less than eighteen years of age. Once these requirements are fulfilled you are eligible to receive a California learner’s permit. You may obtain a full driver’s permit any time after being issued a learner’s permit as long as you can successfully pass the behind-the-wheel driver’s test. Q: Where Do I Take the California Permit Test? Do I Need an Appointment? You can take your driver’s test at any local branch of the DMV that offers driver’s license services. You will only need an appointment for your behind-the-wheel driver’s test, although scheduling an appointment for the written test is a great way to save time during your trip to the DMV. However, it should be pointed out that no tests, regardless of appointment, will be administered after 4:30 pm to ensure that applicants have plenty of time to complete their examinations.